Most texts on marketing research explain the four levels of measurement: nominal, ordinal, interval and ratio and so the treatment given to them here will be brief. However, it is an important topic since the type of scale used in taking measurements directly impinges on the statistical techniques which can legitimately be used in the analysis. The numbers have no arithmetic properties and act only as labels. The only measure of average which can be used is the mode because this is simply a set of frequency counts. Hypothesis tests can be carried out on data collected in the nominal form. The most likely would be the Chi-square test. However, it should be noted that the Chi-square is a test to determine whether two or more variables are associated and the strength of that relationship. It can tell nothing about the form of that relationship, where it exists, i.e. it is not capable of establishing cause and effect. Ordinal scales involve the ranking of individuals, attitudes or items along the continuum of the characteristic being scaled. All of the information a nominal scale would have given is available from an ordinal scale. 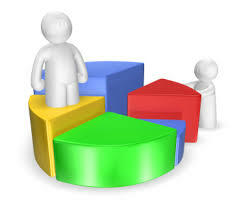 In addition, positional statistics such as the median, quartile and percentile can be determined. It is possible to test for order correlation with ranked data. The two main methods are Spearman’s Ranked Correlation Coefficient and Kendall’s Coefficient of Concordance. Using either procedure one can, for example, ascertain the degree to which two or more survey respondents agree in their ranking of a set of items. Consider again the ranking of pesticides example in figure 3.2. The researcher might wish to measure similarities and differences in the rankings of pesticide brands according to whether the respondents’ farm enterprises were classified as “arable” or “mixed” (a combination of crops and livestock). The resultant coefficient takes a value in the range 0 to 1. A zero would mean that there was no agreement between the two groups, and 1 would indicate total agreement. It is more likely that an answer somewhere between these two extremes would be found. It is only with an interval scaled data that researchers can justify the use of the arithmetic mean as the measure of average. The interval or cardinal scale has equal units of measurement, thus making it possible to interpret not only the order of scale scores but also the distance between them. However, it must be recognized that the zero point on an interval scale is arbitrary and is not a true zero. This of course has implications for the type of data manipulation and analysis we can carry out on data collected in this form. It is possible to add or subtract a constant to all of the scale values without affecting the form of the scale but one cannot multiply or divide the values. It can be said that two respondents with scale positions 1 and 2 are as far apart as two respondents with scale positions 4 and 5, but not that a person with score 10 feels twice as strongly as one with score 5. Temperature is interval scaled, being measured either in Centigrade or Fahrenheit. We cannot speak of 50°F being twice as hot as 25°F since the corresponding temperatures on the centigrade scale, 10°C and -3.9°C, are not in the ratio 2:1. The highest level of measurement is a ratio scale. This has the properties of an interval scale together with a fixed origin or zero point. Examples of variables which are ratio scaled include weights, lengths and times. Ratio scales permit the researcher to compare both differences in scores and the relative magnitude of scores. For instance the difference between 5 and 10 minutes is the same as that between 10 and 15 minutes, and 10 minutes is twice as long as 5 minutes.